In this tutorial you will learn about various Asset Books Regions like Calendar Region, Accounting Rules Region, Natural Accounts Region, Journal Categories Region and Asset Categories Regions. Allow Purge : Purges data from the asset book. GL Set of Books : Enter the GL set of books for creating journal entries. Prorate Calendar : Determine depreciation rate. Current Period : Oracle Assets updates the current period field each time the current period is closed and the next period is opened. Only one period can exist at the time for each asset book. Set up the depreciation calendar for at least one period before the current period. Divide Depreciation : Divides the annual depreciation over the book’s fiscal year periods. Select evenly to divide depreciation evenly to each period or by days. Divide if Retired in the First Year : Selected when depreciating one year old assets. Figure 1. Accounting Rules Region. Allow Amortized Changes, Allow Mass Changes : To allow amortized changes and mass changes in the asset boos, select the check boxes. Capital Gain Threshold : The minimum time you must hold an asset for Oracle Assets to report it as a capital gain when you retire it. To report a capital gain for all retiring assets, enter zero for the threshold. Allow Revaluation : Selected, specifying the applicable revaluation rules. Figure 2. Natural Accounts Region. 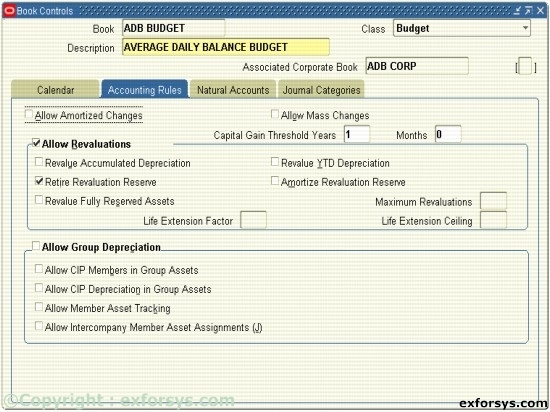 These accounts represent values for the natural account segment from the accounting flexfield associated with the GL set of books assigned to this Asset Book. Retirement Accounts : Set up your gain/loss accounts for Oracle Assets to create individual journal entries for each gain/loss amount to single or separate accounts. Other Natural Account Defaults : Enter Intercompany Receivables and Payables clearing account numbers. 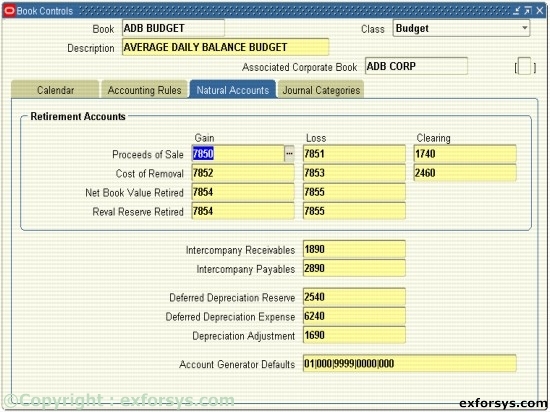 Account Generator Defaults : By default, Oracle Assets creates journal entries without cost center level detail for all accounts except the depreciation expense account, to create journal entries using the expense account’s balancing segment in the assignments window and the account segment from the asset category or book, depending on the account type. Figure 3. Journal Categories Region. This source labels the journal entries that are sent from Oracle Assets to the GL. Choose the Journal Category names you want to use when journal entries are generated from Oracle Assets to the General Ledger. You cannot create new Journal Sources and Categories in this form. You must choose from LOV of already defined sources and categories. Typically, these are defined in the Oracle GL application. Contains general information about the category that remains the same regardless of the asset book that is being attached to the category. Contains the default GL accounts and natural account segments that will be used when assets are added that are assigned to this category. 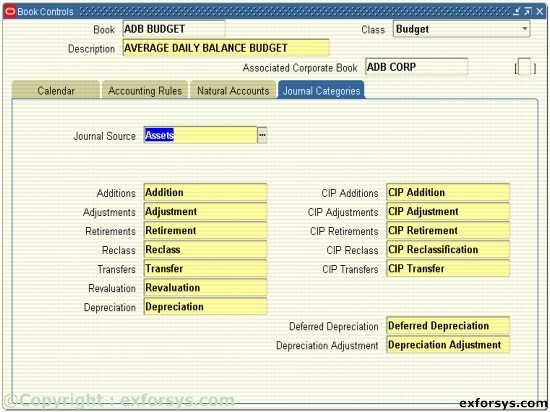 The default GL accounts are setup for each asset book that is associated with this asset category regardless of whether that asset book will create journal entries for the GL. This region contains depreciation rules information that is setup for each asset book associated with asset category.